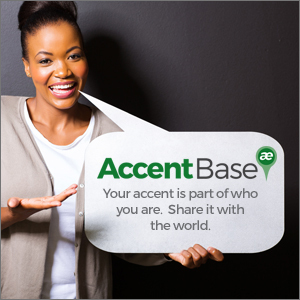 Accentbase is a user interface and application of the web for language learners who struggle with accents. It can also be used by anybody studying or researching accents for any purpose. Currently we are only populating the site for later use. The hope is that we will make revenue from advertising, publishing, partnership and donation. The site is intended to be free at the point of use. What if I send a sound or video file and I change my mind and don't want it to be used? 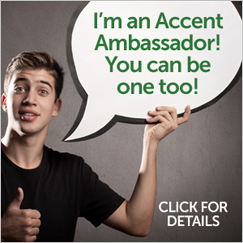 As an Accent Ambassador you are in complete control. We consider the video/file your property at all times. If you want the video/sound file taken down just contact the site via email and we will remove it, you don't have to give a reason. What about other things online about accents? If you have seen videos on YouTube using accent as a theme like Accent Challenge and Accent Tag, you may ask "Is this where the idea for the website came from, and how is Accentbase any different?". The existing accent videos on Youtube and Tumblr are not the inspiration for this website. Having worked for almost twenty years teaching English, the CEO of davelaw.org.uk realised that the web provided an opportunity to provide an educational tool that could overcome the barrier of accent, something all second language learners struggle with. It was only after he had begun working on this idea that he discovered the already huge interest in accent videos elsewhere. There are similarities, but all of the videos and vlogs concerning accent are mainly for entertainment purposes. People may use them to help with understanding, but they weren't necessarily designed or produced for that specific purpose. Because Accentbase videos will be less than 2 minutes long, and the script is very short, the individual phonemes can be isolated. It is hoped that the database the community creates could ultimately be used to inform voice recognition software. We are already working on a phone App that will convert Received Pronunciation into any accent in the English speaking world. The possibilities are endless and this venture is unique. An online educational tool to help with the understanding of local accents and dialects. With better understanding and awareness we can all communicate better and hold on to our accents proudly!